As we all face the long, miserable slide into a post-apocalyptic world due to the greenhouse effect, isn't it comforting to know that there is such a thing as the anti-greenhouse effect? Of course, it only exists on other planets, but there is a way we can bring it to Earth. So, we're coming out of a long winter that proves, in one way or another, that we've murdered ourselves and our children by trashing our environment. It's too late for us. Or is it? If we look elsewhere in the galaxy, if we look, for example, to Titan, we might get a little hope. Titan, the largest moon of Saturn, has a greenhouse effect going on, too, but despite this, it's cooler than it should be. How does it cool itself down? Titan has got its own anti-greenhouse effect happening, because molecules that are good at trapping one kind of energy are sometimes terrible at trapping other kinds. 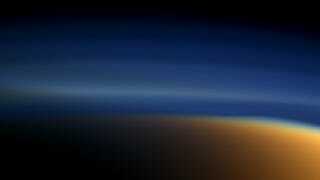 Titan has a lot of organic matter floating around in its upper atmosphere. This organic matter soaks up the sun coming in, creating a layer of heat well away from the lower atmosphere of the moon. What heat gets through to the moon heats up the surface of Titan, which then radiates infrared energy back up. Although the organic molecules trap higher-energy waves, they let infrared energy slip through, keeping the heat out, and also letting the heat out. There are theories that this kind of thing might work on Earth. All we need is to get a lot of organic molecules in our upper atmosphere. The best way to do this -is instigating nuclear winter. Okay, so it's not the best option, but what else are you going to do, bike to work?